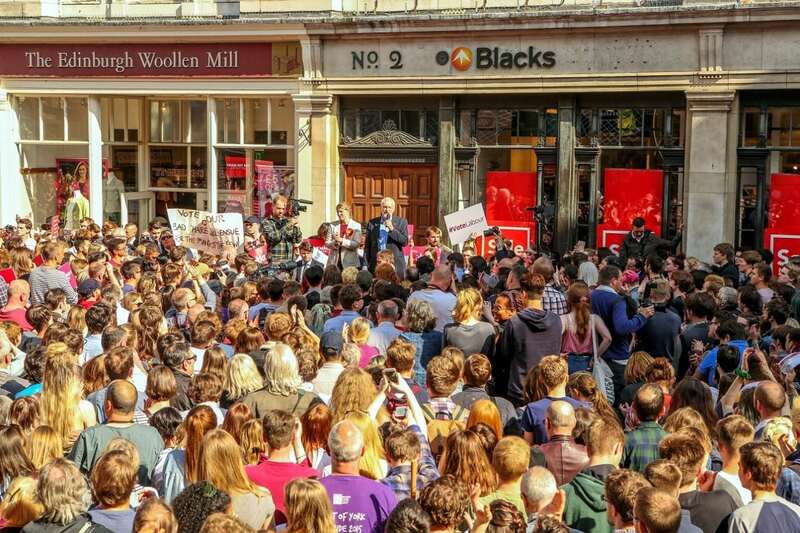 A conservative councillor has refused to apologise after comparing the huge crowds at Jeremy Corbyn’s rallies with Nazi rallies under Adolf Hitler. Cllr Chris Steward, who is a former City of York council leader, drew the comparison on his Twitter account on Sunday, but has since removed the tweet. 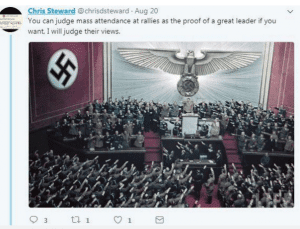 The tweet read: “You can judge mass attendance at rallies as the proof of a great leader if you want, I will judge their views,” and was posted alongside an image of a Nazi gathering. As calls for an apology grew, Cllr Steward defended his remarks and said they pointed out that the number of people attending a rally did not show someone should be judged as good. 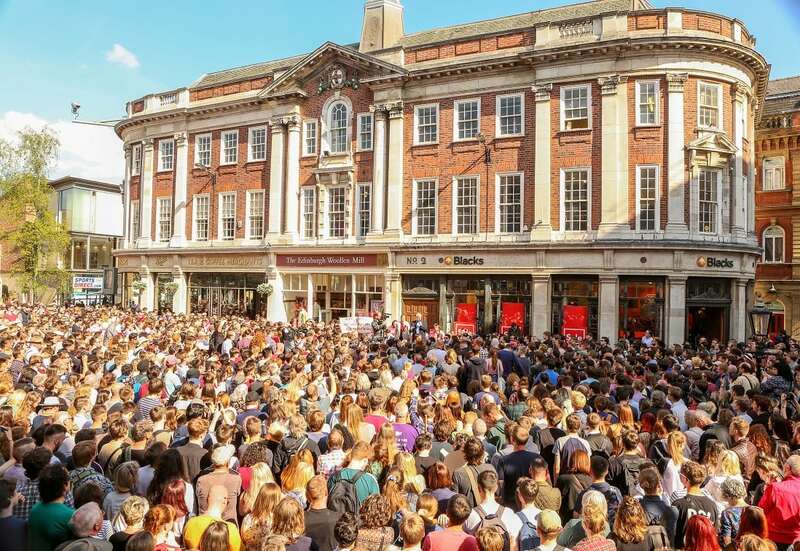 The councillor, who resigned as council leader last year, said: “On Twitter someone said proof Jeremy Corbyn was good was he could attract big crowds. “I merely showed an example that a big crowd did not mean someone was good. York’s Labour group leader Janet Looker said it was “disappointing” to see such comments from both Cllr Steward and Cllr Paul Doughty – another Tory councillor who retweeted the photo. She said: “This is a very disappointing statement to hear being made by local Tory councillor Chris Steward. “Both he and fellow Tory councillor Paul Doughty tweeting this kind of stuff shows a total loss of perspective if they see increasing interest and engagement in our democracy, particularly amongst young people, as reason to compare a Jeremy Corbyn rally to that of Adolf Hitler. 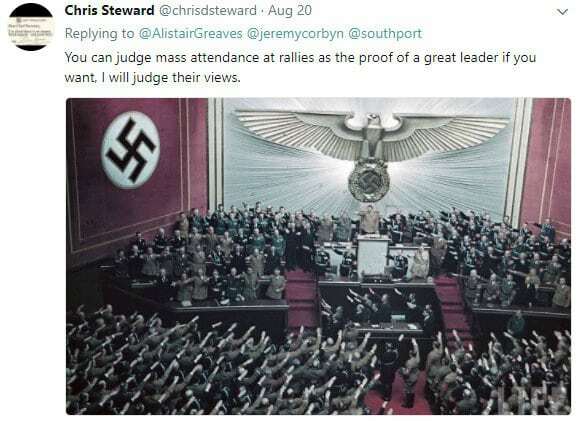 Cllr Steward’s original tweet was a result of an exchange with Alistair Greaves, a York Labour Party organiser, who had tweeted footage of a Corbyn rally in Southport and commented: “Thousands in marginal @Southport obviously don’t believe Tory lies about @jeremycorbyn”. Mr Greaves later said he thought the comments were “unprofessional” and “not well thought-out”, and added that Cllr Steward should consider the people he represents, and how they might feel about the comments. Cllr Doughty, who retweeted the original comment, said he did not think anyone who attended Jeremy Corbyn’s rallies did so because of a similarity with Nazism. But, he added: “I feel there is an awful lot of hypocrisy from elements of the left. “Prime examples of this include yesterday when Labour MP Laura Pidcock indicated she wouldn’t “hang out” with Conservatives because we are ‘the enemy’. “In York this year, I and others, including 70-year-old women, have experienced hate and abuse from elements of the Left simply because we were representing the Conservatives – and this was at the Pride event which was supposed to be about inclusivity.